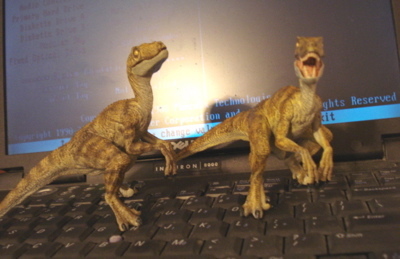 You can get your own Velociraptor direct from Amazon by clicking here, now, before they all run off. As can be seen, these are very ferocious hunters and do not let their small size stand between themselves and the dinner table. The Deinonychus was one of the earliest and largest of the V- Raptor family, a bipedal carnivorous Dinosaur that distinguished itself with an enlarged claw on the inside of each foot and the speed and agility to use it to slash, slice and dice, much like an animated cuisinart, in bringing down its prey. Since much prey was significantly larger than the Raptor it hunted in packs, much like today's wolves. This set the pattern for all V- Raptors that came afterward. A most successful predator. 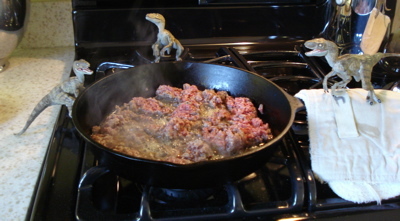 You can learn more about the Velociraptor, here. The next really significant Velociraptor year was 1993. 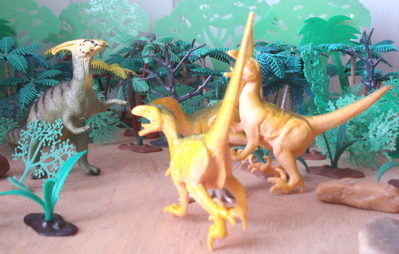 In that year Kenner came out with their very toy-like Raptor in the merchandising for the first Jurassic Park movie. The poverty of this figure when compared to, say their Big-Red T-Rex, remains incomprehensible. Meanwhile Safari, Ltd. came out with what I refer to as the "Tiger" V- Raptor in ~1/6-10 scale. A truly ferocious looking beauty. These have since been repainted and although I have only seen photos, it looks terrific. 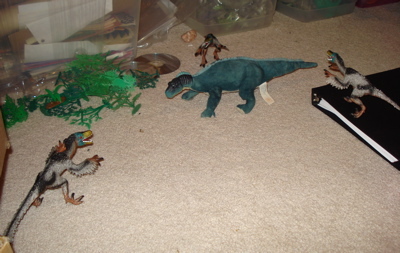 With apologies to Jurassic Park fans I simply have short shrift with nearly all their toys. Largely for their very toy-like quality. 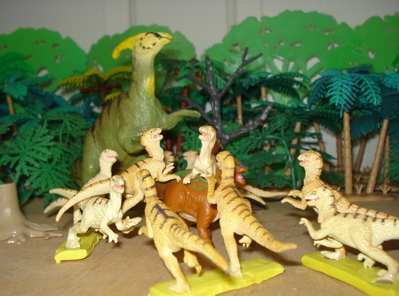 Even the original JP.03 plastic Raptor that came out in 1993 (Kenner) (alongside the GREAT Kenner figures) is toy like. 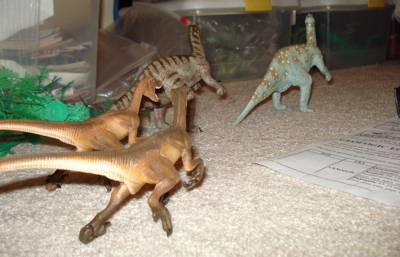 The other (Hasbro) Raptors, which came out in 2000, whether electronic (requiring expensive battery replacement) or simply with moving parts, are just too toy-like for my personal taste. I've got some. They'll get their page. Then off to eBay. 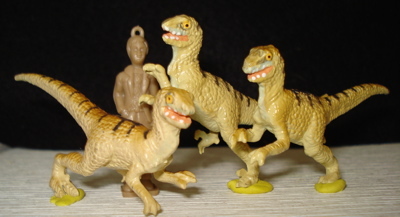 In 1998 the JP brain trust came up with their "chaos effect" series of which this "Paradeinonychus" is a member. I really can't say very much about a trans-species imaginary creature except that it at least has no pretensions and little in the way of detail. I suspect these were created to maximize the "profit effect" and cash-in on children liking bright colors. 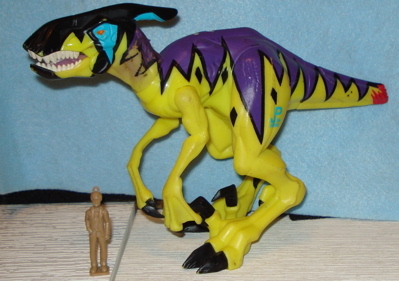 1994 saw the Atari weird plastic Raptors make the scene and 2000 the Disney Baronyx looking electronic Raptor as well. They just kept on coming. The next significant entry in the Raptor wars is the 2005 PAPO Raptor. This fabulous, life-like and highly detailed creation, left me open-mouthed. 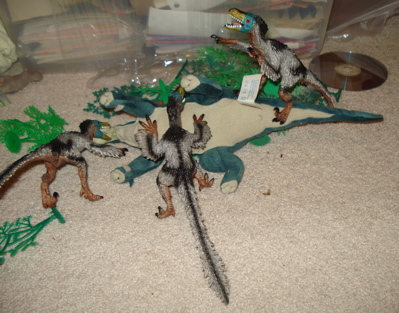 Based on the Raptors from the original Jurassic park movie they are at home, at home, whether working on the computer, cooking dinner or going over the family finances. The movable lower jaw offers a variety of expression and the excellent, well balanced sculpt provides the ability to stand up and do whatever a toy Velociraptor must do to survive in the 21st Century. I have read that the movie took license with the Raptor (being stalked by a chicken-sized critter doesn't create much tension) and I'm not sure how accurate this Papo version is. But it is certainly a great toy. 2007 saw the introduction of the most beautiful (the Safari, Ltd.) Velociraptors and 2008 saw the most controversial (in the Bullyland). That feathered fellow from Bullyland is an "I love it" or "I hate it" figure. Here we see a Starbean Iguanodon who is on the "I hate them" side of the question, and for good reason. If I give you my opinion now it will just spoil the page for you. As you noticed, I do take sides. This Bullyland version is ~1/20 scale. 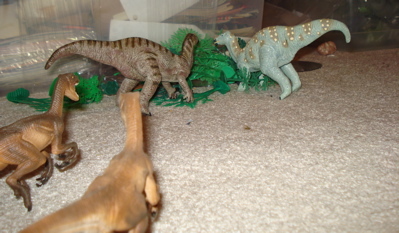 Velociraptors were rather small, in fact, being no more than about seven feet in length. 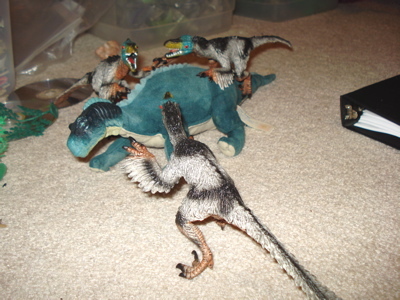 This would make your average Raptor Dinosaur toys about two inches in size. That is why we see them generally comparing up more like Allosaurs than themselves. 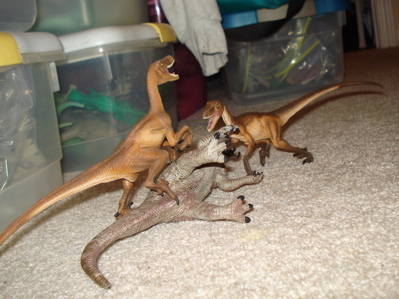 The Jurassic Park movie really skewed our perception of these Dinosaurs. However the absolutely best looking Velociraptor to date has been created by Safari Ltd.
combines a dynamic sports-car pose that radiates his speed and activity with beautiful detail throughout the figure. It looks like it's moving even when it's parked. I have two of these and while both are brown, one is lighter shaded and I can only presume that Safari has presented these in a range of shades making each as individual as possible. You can get your own fuzzy little, feathered or not, Velociraptor direct from Amazon by clicking here. 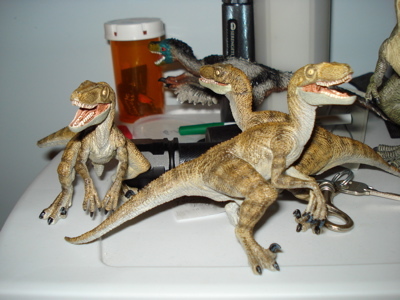 These inexpensive China Trademark Velociraptors are ~1/12 scale. 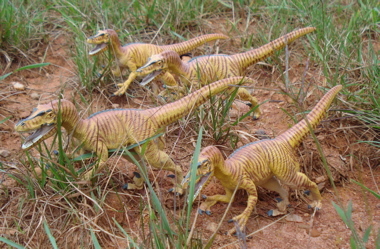 We have created our website, The Dinosaur Toys Collectors Guide, to help you, our reader, in the recognition of the many various Dinosaur toys out there. Whether you are a collector of historical figures or a purchaser of Dinosaur toys for a friend or a child, you will find the information to make an informed choice right here.